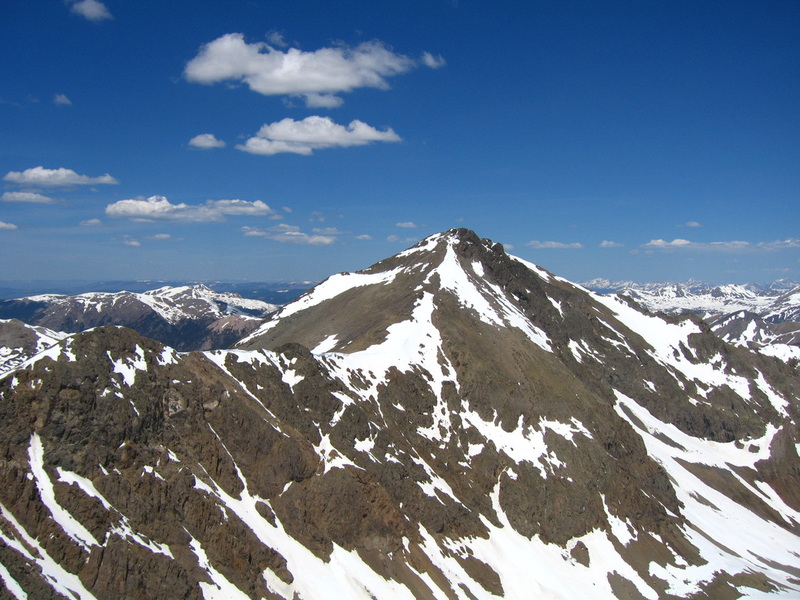 This peak I did solo while Mandy and another friend did Mount Elbert. Since I had no interest do go up Elbert again, we all agreed to camp at the lower Elbert trailhead, then I would take the car up to the McNasser Gulch trailhead and climb Grizzly by myself then come back and pick them up before driving back to Golden. So I drove up to McNasser Gulch which looked like it hadn't seen much traffic yet and parked where a large tree blocked the road. From here I parked and began hiking up the old road that Josh, his dad and I drove up a few years earlier. Around treeline I noticed the upper basin was going to have quite a bit of lingering snow which was nice. Hiking on the hard snow through the basin was quick and easy and I reached the base of the south facing steep slope that leads to the east ridge standard route. This slope is known to be loose but I didn't find it so bad. I remember Josh saying it was the worst slope he had ever been on but maybe he was off route. Once I crested the east ridge, the fun began. Lingering snow made parts of the ridge turn from Class 2+ to Class 4 as I had to climb on the ridge directly to stay on rock. I was just trying to avoid steep snow. I continued to scramble up the ridge passing a couple really cool notches with steep cliffs going down the north side of the ridge. 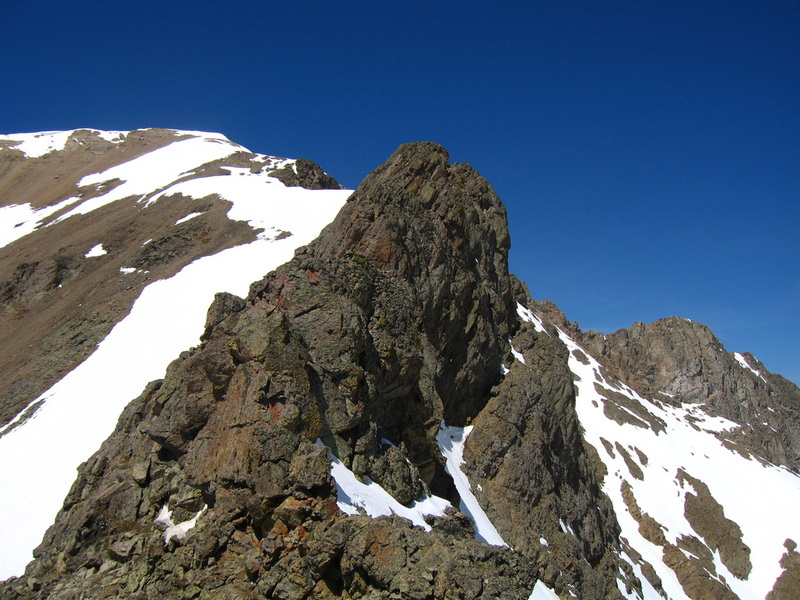 The rock here was also very odd for the Sawatch Range. 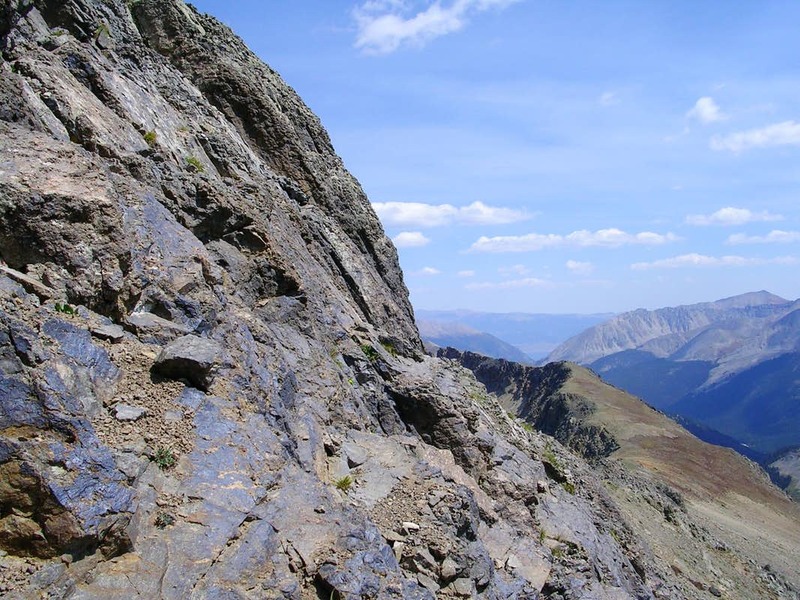 Very friable and volcanic in nature whereas most of the Sawatch is metamorphic and more granitic. The final scramble to the summit was fun and I remember looking down the north couloir and admiring the cliffs dropping to the north. There aren't many cliffs like that in the Sawatch so it was a cool sight. On the summit I enjoyed being on the highest 13er in Colorado and took a nice long break. The weather was sunny and warm with no wind. I decided to continue and traverse to Garfield Peak since it was right there. This traverse was horrible though and had some of the worst rock I have ever been on. climbing back up to Garfield Peak after reaching the saddle between the two peaks took the phrase "one step up two steps down" to a whole new level. I had to really fight hard to make upward progress. Once I finally made it though the views were even better as I could now see Grizzly Peak and the sun was lower making for better lighting. 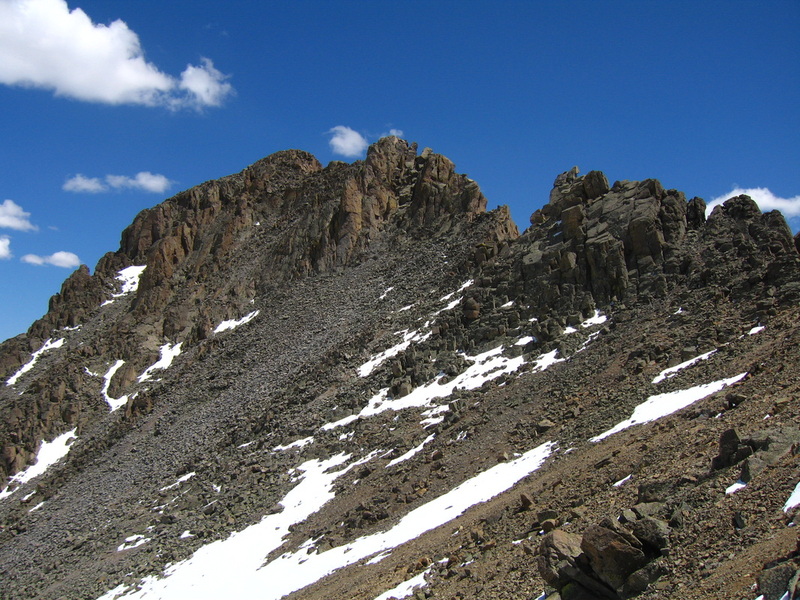 I began descending the loose east ridge of Garfield to complete the McNasser Gulch circumnavigation and located a great snowfield to glissade down. 800 feet of pure joy as I slid down soft snow back to the basin and hiked out back to the car. The hike down the basin was pretty bad though as I punched through the snow much of the way down at times past my waist! Eventually I made it back to bare ground and drove around to pick up Mandy at which point some afternoon storms formed and made for a nice cool drive home.